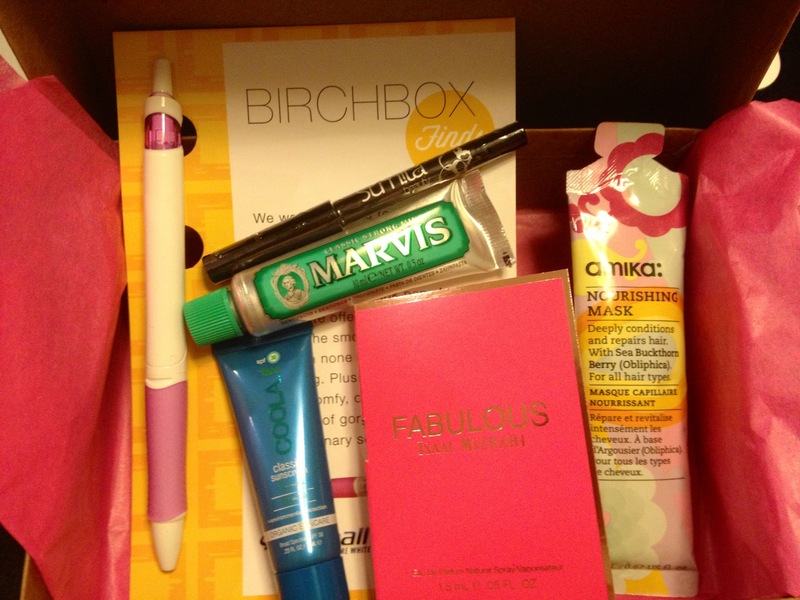 My May Birchbox has arrived! And so has my May Ipsy Glam Bag! What the what? What’s an Ipsy Glam Bag you ask? Well, I recently found out about a service very similar to Birchbox called Ipsy. They also send out monthly fun mail full of beauty samples. So I thought I’d get both and compare and decide which one I’d like to stick with. amika Obliphica Nourishing Mask for hair. A great box for sure! Now let’s look at this month’s Ipsy Glam Bag. By the way, I do know how to use my shift key but some of these beauty brands are non capitalized. So…the details. Each subscription is $10 a month. Birchboxes come in a little brown cardboard box with hot pink tissue. They get a point because I can recycle the box when I’m finished with it. But Ipsy sends you a little cosmetic bag each month. I’m pretty full up on bags, this is true, but I can always find a use for a little bag. Mostly I give them away as little gift bags. In the 7 months or so that I’ve been receiving Birchboxes I’ve only gotten one or two full size products. My Ipsy bag had 2 full sized products right off the bat! Now, who knows, they may be trying to butter me up with my first bag. One other cool thing about Ipsy is that once the Glam Bags have been sent out you can go online to Ipsy.com and check out what everyone got in their bags, plus all past bags. Another cool thing is that you take a beauty quiz on Ipsy and they choose colors for you based on your skin tone, coloring etc. The verdict…Sorry Birchbox, we’ve had a great run, and I may come back to you at some point. But for right now Ipsy has won me over! I just joined Ispy, too, and got my first one. I’ll do a post on my blog and show what I got. I feel the same about BirchBox! I wrote a review as well.